Yesterday was a long day! But it was fine, I made it without a nap! Yay! I'm so glad I made the short trip to enjoy Noah's T-Ball scrimmage. T-Ball is the cutest sport in the world, by the way. It was a beautiful thing witnessing his enthusiasm. Talk about doing things good for the heart and soul! Noah hit the ball, ran the bases, scored a run, and threw the ball! His best friend from school is on the team, too! It was a great evening. I came home and prepared a good on-plan dinner, too. A colleague of mine sent me a photograph that someone took of me on this day five years ago. It was April 3rd, 2014, right before the turnaround from relapse/regain. I was at the top of that regain. I didn't take a lot of pictures back then, on purpose...but this one was taken without my knowledge. Oh my--I look at it and remember how lost I felt. 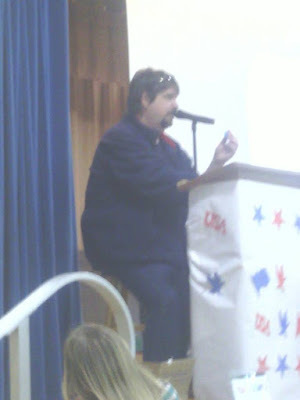 But those memories quickly turn positive when I realize the dawn was coming for this guy in the picture, calling bingo numbers for an elementary school fundraiser. I guess the message is, no matter where you are, don't give up. It's always darkest before the dawn, right? I really appreciate your one day at a time perspective on maintenance as well as learning about your 'rails of support' and the changes you are still making to strengthen your daily practice. I have two questions: 1) I've noticed that you've not been posting first thing in the morning after your foundational morning practice. Is there a reason for your adjustment? 2) when you say "refined" sugar free, what does that mean? I know that I'm a sugar addict, for sure, and read labels carefully as do you. I'm also very lucky that because I do all the shopping and most of the cooking in my family, it should be "easier" for me to control what comes into the house,and my family is really supportive. Understandably, they would like some groceries with natural sugars. I do purchase fruit for my family, and try to stay away from it because it feeds the sugar monster in me. Fortunately, I am able to substitute veggies (because I've never met a single veggie I didn't like). The only other sweet stuff currently in our house is honey, and unfortunately as much as I used my own distraction/support/meditation practices, I chose to get into the honey jar (not unlike a fictional bear I like). I take responsibility for my actions, and understand that every person is different, but I wonder how you found out that natural sugars aren't a trigger for you? Thank you for sharing what works for you? I understand it may not work for me, but your experience is very useful.